I’ve greatly expanded this page since first posting it in 2015, when it was a follow up to newsletter issue 71, “Beyond Crochet Hook Debates”. It’s also now part of an ongoing Crochet Basics series. At first glance the crochet hook is a very simple tool, so why are there so many different kinds? What makes crocheters fiercely devoted to some and not others? You could make your own crochet hook by carving a notch into the end of a stick or dowel and sanding it smooth. I realized how carefully designed hooks really are when I reshaped a store-bought one. Please enjoy my deluxe crochet hook diagram and a “hook heat map” from my newsletter (free PDF): Complete Diagram of a Standard Crochet Hook. Creating a crochet hook diagram also helped me tease out the finer elements that make all the difference between one hook and another. My first sketch grew into a comprehensive map! It brings together terms from several different sources. How many crochet hook sizes should there be? How many crochet hooks does a crocheter need? It turns out the answer is different for every crocheter because it depends on about five factors, below. Consider the yarn you like to crochet with. Some crocheters are very partial to one or two yarn thicknesses, called weights. Medium or worsted weight is a crowd-pleaser, for example. If you like to crochet with yarn of any weight, from cobweb to roving, you need a few different hook sizes for each of the eight yarn weight categories (#0 Lace to #7 Jumbo)! I’m still surprised sometimes when a crochet hook gets along much better with one yarn than another. If you like to experience the full menu of fibers and fiber blends, from the fuzziest to the slipperiest all spun in different ways, you’re going to need hooks with different head shapes and surface finishes. I really notice this when I crochet with a non-yarn like wire, jewelry cords, and fabric strips. I can pick up a lot of speed with a hook that has a glossy aluminum finish except with very glossy silk yarn. That’s when a brushed matte finish is better. When a fluffy microfiber (synthetic) yarn drags on a giant plastic hook because of static electricity, I switch to a wood hook. When a yarn is dense and round like spaghetti (Jelly Yarn, rayon-wrap cordé, wire, tubing, leather lacing, etc. ), a crochet hook with a roomy “bowl”[see diagram] is much better than one with a slit-style bowl. Want to try every possible kind of project, from beaded jewelry to exploded lace to sturdy totes to thick blankets to…so many more kinds of things!? Projects can require very particular crochet hook sizes, styles, and finishes. Situations, events, and physical conditions. I have favorite hooks for marathon crocheting (when I have a big crochet deadline to meet). You might like to have a hook set just for traveling like I do; for plane flights I try to avoid metal hooks. Plastic and wood hooks are lighter in my bag, and less quick to slide down between seats to be lost forever. For those crocheters with hands that are particularly small or large, sensitive to cold, tire easily, are arthritic or in recovery from surgery, and so on, there are crochet hooks specially designed for you. Look for hooks in ergonomic shapes. You can also add your own ergonomic handle with clay, pencil grippers, wrapped fabric, and other materials. What if you need to crochet in a low- or no-light situation? Light-up hooks, and those that don’t match the color of your yarn are best. Any special techniques or stitches? Like to try dramatically different stitches like bullions, split clusters, and picking out that bump loop of single crochets? Tunisian and double-ended crochet? Crochet along the edge of fabric? Cro-tatting? The right crochet hook for the job sure makes a big difference with these. “Loop Picking”: Hooks with a pointier head are very helpful when trying to pick specific loops to crochet into. Camel crochet is a classic case. I usually reach for one when I do Tunisian or slip stitch crochet. Some brands are naturally pointier. I like how easy it is to file the heads of my inexpensive bamboo hooks in different shapes to learn what works best for me. Beading: I need to have steel crochet hooks of several sizes on hand. You’ll need some with hook heads that are small and streamlined enough to pull a loop of thread or yarn through bead holes. Tulip has done this with their bead crochet hooks. Tunisian: (Projects can really vary, so I’m going to do a separate post on Tunisian hooks.) Generally I need the length of the hook head to be as short as possible [see diagram], and I need the surface to be frictionless with the particular yarn. “Hard Crochet”: The 1970’s crocheter Mark Dittrick emphasized the difference a large steel hook (size 0 or 1: 2.35–3.25 mm) makes for his ultra tight and stiff sculptural crocheting. Did a family member teach you how to crochet? My mother taught me. I treasure her crochet hooks and the brown moiré jewelry wrap that she used as a hook case. When you teach a family member, you create a future where your favorite crochet hooks will be cherished! If you know someone who would like this detailed crochet hook diagram, please be kind and send them to this blog post so that they can download their own copy directly. 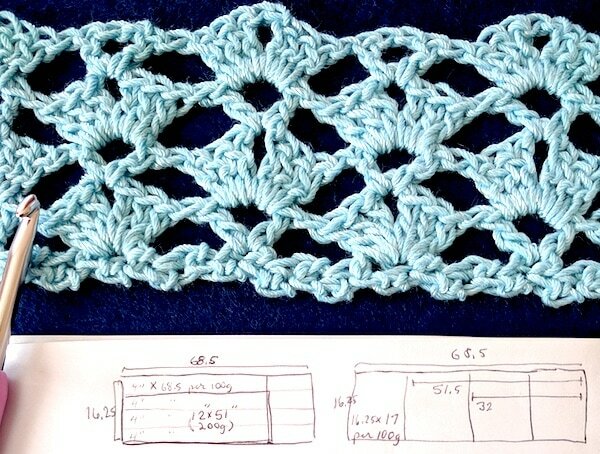 Right-click this direct link to copy it: https://www.designingvashti.com/crochet-hook-diagram-free-download. Thanks! The next post in this series is on the surprisingly rich topic of crochet hook sizing.